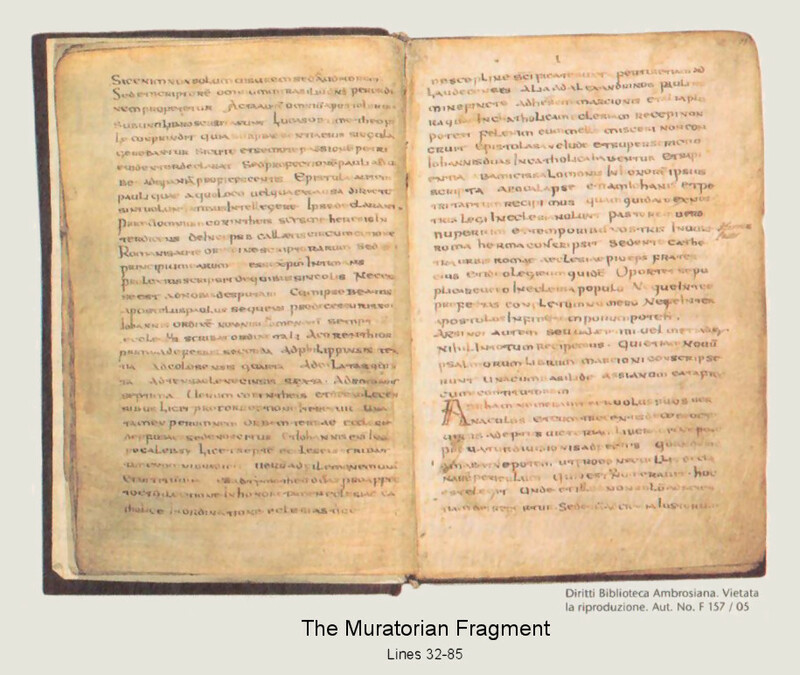 The Muratorian Fragment is the oldest known list of New Testament books. It was discovered by Ludovico Antonio Muratori in a manuscript in the Ambrosian Library in Milan, and published by him in 1740. * It is called a fragment because the beginning of it is missing. Although the manuscript in which it appears was copied during the seventh century, the list itself is dated to about 170 because its author refers to the episcopate of Pius I of Rome (died 157) as recent. He mentions only two epistles of John, without describing them. The Apocalypse of Peter is mentioned as a book which "some of us will not allow to be read in church." A very helpful and detailed discussion of this document is to be found in Bruce Metzger's The Canon of the New Testament (Oxford: Clarendon Press, 1987), pp. 191-201. Below is Metzger's English translation of a critically amended text of the Fragment, from Appendix IV of the same book (pp. 305-7). I include Metzger's footnotes, with their original enumeration, and add some supplementary footnotes of my own. —M.D.M. * Ludovico Antonio Muratori, ed., Antiquitates Italicae Medii Aevi, v. 3 (ex typographia Societatis palatinæ, Mediolani, 1740). Reprinted in Bologna, 1965. The following translation usually follows the amended text edited by Hans Lietzmann, Das Muratorische Fragment und die Monarchianischen Prologue zu den Evangelien (Kleine Texte, i; Bonn, 1902; 2nd ed., Berlin, 1933). Owing to the wretched state of the Latin text, it is sometimes difficult to know what the writer intended; several phrases, therefore, are provided with alternative renderings (enclosed within parentheses). Translational expansions are enclosed within square brackets. The numerals indicate the lines of the original text. For a discussion, see chap. VIII.1 above, where freer renderings are sometimes given in place of the following literalistic translation.
. . . at which nevertheless he was present, and so he placed [them in his narrative]. (2) The third book of the Gospel is that according to Luke. (3) Luke, the well-known physician, after the ascension of Christ, (4-5) when Paul had taken with him as one zealous for the law,  (6) composed it in his own name, according to [the general] belief. Yet he himself had not (7) seen the Lord in the flesh; and therefore, as he was able to ascertain events, (8) so indeed he begins to tell the story from the birth of John. (9) The fourth of the Gospels is that of John, [one] of the disciples. (10) To his fellow disciples and bishops, who had been urging him [to write], (11) he said, 'Fast with me from today to three days, and what (12) will be revealed to each one (13) let us tell it to one another.' In the same night it was revealed (14) to Andrew, [one] of the apostles, (15-16) that John should write down all things in his own name while all of them should review it. And so, though various (17) elements [3a] may be taught in the individual books of the Gospels, (18) nevertheless this makes no difference to the faith (19) of believers, since by the one sovereign [3b] Spirit all things (20) have been declared in all [the Gospels]: concerning the (21) nativity, concerning the passion, concerning the resurrection, (22) concerning life with his disciples, (23) and concerning his twofold coming; (24) the first in lowliness when he was despised, which has taken place, (25) the second glorious in royal power, (26) which is still in the future. What (27) marvel is it then, if John so consistently (28) mentions these particular points also in his Epistles, (29) saying about himself, 'What we have seen with our eyes (30) and heard with our ears and our hands (31) have handled, these things we have written to you? (32) For in this way he professes [himself] to be not only an eye-witness and hearer, (33) but also a writer of all the marvelous deeds of the Lord, in their order. (34) Moreover, the acts of all the apostles (35) were written in one book. For 'most excellent Theophilus'  Luke compiled (36) the individual events that took place in his presence — (37) as he plainly shows by omitting the martyrdom of Peter (38) as well as the departure of Paul from the city [of Rome] [5a] (39) when he journeyed to Spain. As for the Epistles of (40-1) Paul, they themselves make clear to those desiring to understand, which ones [they are], from what place, or for what reason they were sent. (42) First of all, to the Corinthians, prohibiting their heretical schisms; (43) next,  to the Galatians, against circumcision; (44-6) then to the Romans he wrote at length, explaining the order (or, plan) of the Scriptures, and also that Christ is their principle (or, main theme). [6a] It is necessary (47) for us to discuss these one by one, since the blessed (48) apostle Paul himself, following the example of his predecessor (49-50) John, writes by name to only seven churches in the following sequence: To the Corinthians (51) first, to the Ephesians second, to the Philippians third, (52) to the Colossians fourth, to the Galatians fifth, (53) to the Thessalonians sixth, to the Romans (54-5) seventh. It is true that he writes once more to the Corinthians and to the Thessalonians for the sake of admonition, (56-7) yet it is clearly recognizable that there is one Church spread throughout the whole extent of the earth. For John also in the (58) Apocalypse, though he writes to seven churches, (59-60) nevertheless speaks to all. [Paul also wrote] out of affection and love one to Philemon, one to Titus, and two to Timothy; and these are held sacred (62-3) in the esteem of the Church catholic for the regulation of ecclesiastical discipline. There is current also [an epistle] to (64) the Laodiceans, [6b] [and] another to the Alexandrians, [6c] [both] forged in Paul's (65) name to [further] the heresy of Marcion, and several others (66) which cannot be received into the catholic Church (67)— for it is not fitting that gall be mixed with honey. (68) Moreover, the epistle of Jude and two of the above-mentioned (or, bearing the name of) John are counted (or, used) in the catholic [Church];  and [the book of] Wisdom, (70) written by the friends [7a] of Solomon in his honour. (71) We receive only the apocalypses of John and Peter, (72) [7b] though some of us are not willing that the latter be read in church. (73) But Hermas wrote the Shepherd (74) very recently, [7c] in our times, in the city of Rome, (75) while bishop Pius, his brother, was occupying the [episcopal] chair (76) of the church of the city of Rome. [7d] (77) And therefore it ought indeed to be read; but (78) it cannot be read publicly to the people in church either among (79) the Prophets, whose number is complete,  or among (80) the Apostles, for it is after [their] time. (81) But we accept nothing whatever of Arsinous or Valentinus or Miltiades, (82) who also composed (83) a new book of psalms for Marcion, (84-5) together with Basilides, the Asian founder of the Cataphrygians [8a] . . .
1 The meaning may be that Mark arranged the material of his Gospel in the order indicated by Peter, who was participant in the events narrated. 2 The reading of the Fragment, quasi ut uris studiosum, 'as so to speak, one zealous for (or, learned in) the law,' has been variously interpreted and/or emended. For example, Routh took iuris as translating του δικαιου, i.e. Luke was studious of righteousness; Buchanan replaced ut iuris with adiutorem, 'assistant'; Bartlet supposed that the translator read νοσου as νομου (Luke was 'a student of disease'); Zahn replaced ut iuris with itineris, thereby referring to Luke's readiness to accompany Paul on his journeys; Lietzmann conjectured litteris, i.e. Luke was well versed as an author. Harnack (Sitzungsberichte der königlich Preussischen Akademie der Wissenschaften , p. 213) and Ehrhardt (op. cit. ), who retain iuris studiosus of the Fragment, have pointed out that in technical language of Roman law this could refer to an assesor or legal expert who served on the staff of a Roman official. Although this title was current prior to the time of Justinian's Digest (published in 533) and so was available to the translator of the Fragment, it is anybody's guess what Greek phrase it represented—assuming, of course, that the Canon was drawn up originally in Greek (unfortunately no help is provided in David Magie, De Romanorum iuris publici sacrisque vocabulis sollemnibus in Graecum sermonem conversis [Leipzig, 1905]). It is significant that the Latin text of the Fragment appears to have been a source for Chromace of Aquileia, who in his commentary on Matthew (written between 398 and 407) refers to Luke as follows: Dominum in carne non vidit, sed quia eruditissimus legis erat quippe qui comes Pauli apostoli ... (See Joseph Lemarie, 'Saint Chromace d'Aquilee temoin du Canon de Muratori,' Revue des etudes augustiniennes, xxiv , pp. 101-2). 3 Here ex opinione is taken as the equivalent of εξ ακοης. Others conjecture ex ordine, representing καθεξης ('orderly sequence.' Luke i.3). 5a That is, the city of Rome. This lack of specificity is one indication that the author was a Roman. —M.D.M. 6 The letter 'b' in the Latin text before 'Galatians' may belong to 'Corinthians' (προς Κορινθιους Β'). 6b Tregelles writes, “It appears impossible to suppose that the cento of phrases from St. Paul’s genuine Epistles, often found in Latin MSS. under the name of Epistola ad Laodicenses, is here intended. … the writer seems to have intended the Epistle to the Ephesians, which Marcion altered, and to which he gave this name, either as part of his changes, or it may be from having obtained his copy of it from Laodicea.” (p. 47) —M.D.M. 6c Nothing is known of the Epistle to the Alexandrians mentioned here. —M.D.M. 7 It may be, as Zahn (Geschichte, ii, 66) and others have supposed, that a negative has fallen out of the text here. 7a Tregelles suggests that the Latin translator of this document mistook the Greek Philonos "Philo" for philon "friends." Many in ancient times thought that the so-called "Wisdom of Solomon" was really written by Philo of Alexandria. —M.D.M. 7b The Apocalypse of Peter describes with some imaginative detail the torments of hell and the blessings of heaven. It was read with respect and used for admonition throughout the churches in early times. —M.D.M. 7c The Shepherd of Hermas is another work widely read in early times. It is a kind of moral allegory, like Bunyan's Pilgrim's Progress, but more impressive in that it purports to convey a series of divine revelations. —M.D.M. 7d This would be Pius I, bishop of Rome from about 142 to 157. —M.D.M. 8 Perhaps the Fragmentist means that there are three major Prophets and twelve minor Prophets. 8a The few words that follow this are unintelligible, and so the fragment practically ends here. —M.D.M. 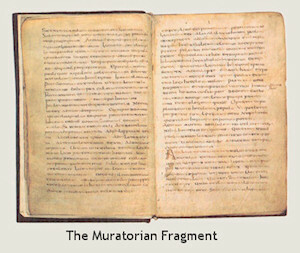 The Latin text of the fragment, which is believed by most scholars to be a translation from Greek, is full of barbarisms and obscurities. Various scholars have published emended texts, as for example Westcott in his General Survey of the History of the Canon of the New Testament (London, 1870). For a critical edition and commentary see S.P. Tregelles, Canon Muratorianus: The Earliest Catalogue of the Books of the New Testament, Edited with Notes and a Facsimile of the MS. in the Ambrosian Library at Milan (Oxford: Clarendon Press, 1867). I give the original text below, without any alteration, and with the original line breaks, as printed in Henry M. Gwatkin, ed., Selections from Early Writers Illustrative of Church History to the Time of Constantine (London: MacMillan and co., 1937), pp. 82-88. The horizontal line put over some letters is the scribe's mark of abbreviation. 8. ita et ad nativitate iohannis incipet dicere. 9. quarti evangeliorum iohannis ex decipolis.